Chazelet is a tiny but beautiful little ski resort with south facing slopes across the valley from the La Grave lift. It has five lifts, five pistes, and one very nice mountain restaurant. A reasonable skier will exhaust the on-piste possibilities in a morning, but the off-piste can be great on the right day and there are some fantastic ski touring possibilities. You may have gathered that I have a soft spot for the area, and I like to ski, or ski tour, there at least a couple of times a season. 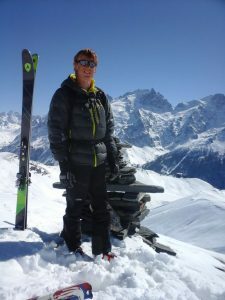 One such occasion was last spring when I climbed the Petite Buffe with regular ski buddy Colin. The Petite Buffe is not really a peak as such, more a prominent point on a long ridge leading to higher Buffes (Pics de la Buffe d’en haut). 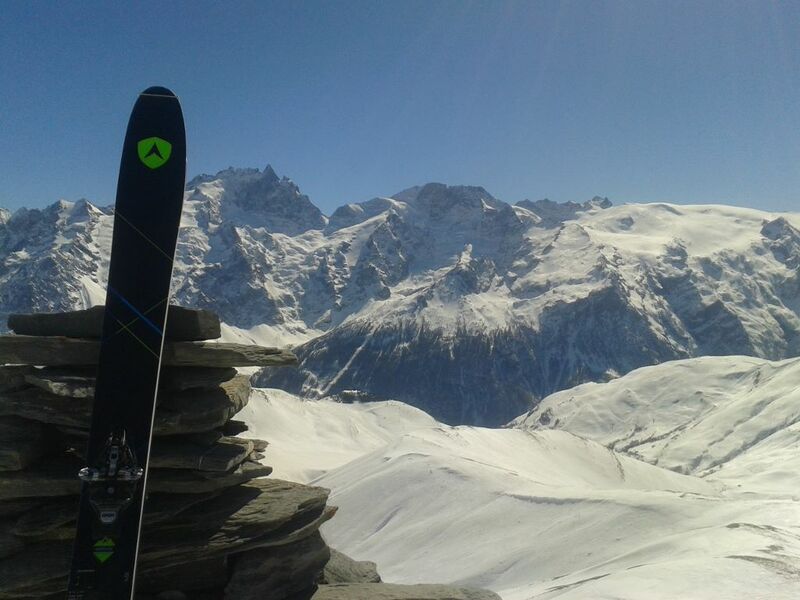 It does have a trig point and a fantastic view, making it a worthwhile high point for a wonderful ski tour above Chazelet. We took the Les Plagnes button lift to reach the col at 2108m and cut out a little climbing. A long traverse into the Combe de Martignare brought us to the beginning of our ascent at around 2000m. From the moment we left the pistes we did not see another soul. In fact, on the ascent the only other tracks we saw belonged to chamois. Speaking of chamois, we did see a lot of those. A herd of thirty or so crossed the slopes above us, and two led the way for us for a portion of the climb. The climb ascended gently but all too briefly up a scenic river valley before we had to boot pack up a steep slope to gain a short narrow ridge leading to the open south slopes of the Petite Buffe. Climbing these to a shoulder led us onto the south-east ridge of our Buffe and it was time to take skis off. The ridge is narrow, airy and exposed but not difficult. It makes the approach to the summit of the Buffe feel quite exhilarating. On arrival at the trig-point you are rewarded with a view of the Meije-Rateau panorama which is so good I’ve used it as the header all over this website. We admired it for a good while before starting the descent to Chazelet. We crossed the ridge to descend the South West side of the Buffe ridge. Here we were a little disappointed to see two sets of tracks in the distance. They were nowhere near our planned route, but even so they were the first sign of other humans we had encountered for some time. 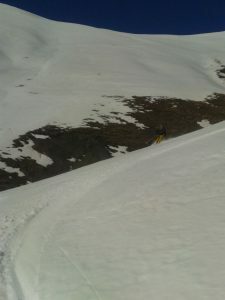 The first part of the descent followed close to the ridge, taking us to the top of a large bowl of untracked spring snow. 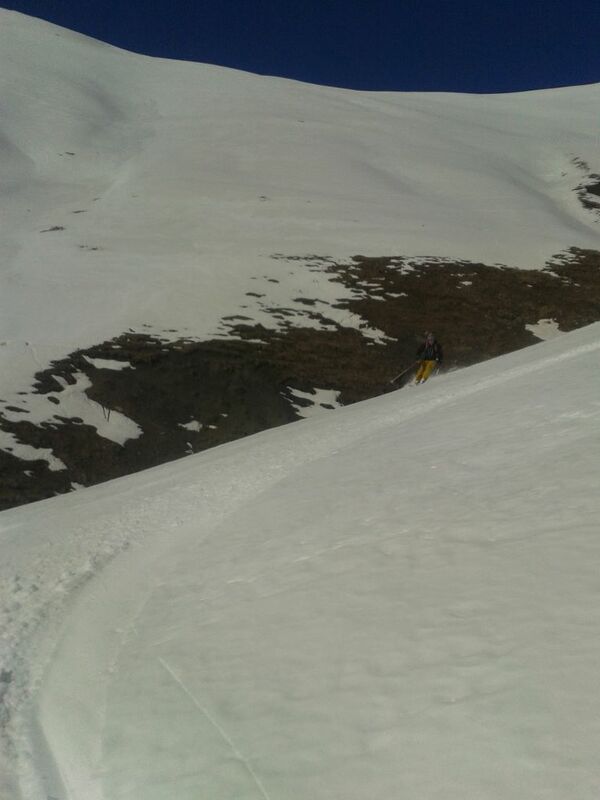 We descended this one at a time, turn after turn after turn, for around 500 vertical metres. It was a descent we didn’t want to end, but of course it did. A scenic traverse close to the river led us in the afternoon sun to Chazelet’s only chairlift. From there it was a short ski to the one restaurant and a welcome beer. 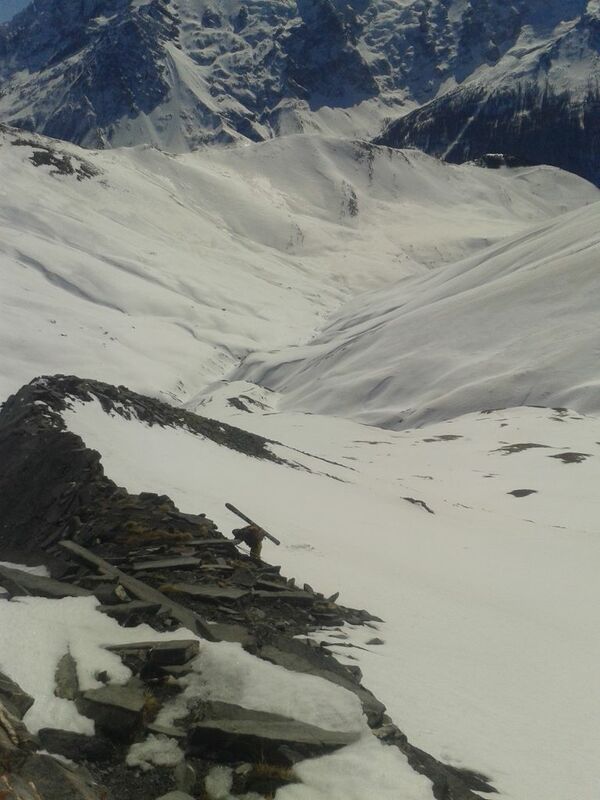 This is a great route at mid-altitude with quite an airy mountaineering feel to it. 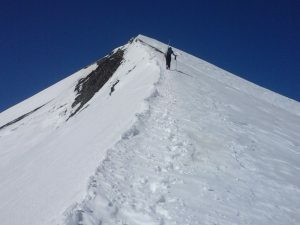 It is not difficult, but you do need to be comfortable skinning up steep ground and have a reasonable head for heights. Get in touch if you want to organise a day trip with an instructor.